CORMIX is a USEPA-supported mixing zone model and decision support system for environmental impact assessment of regulatory mixing zones resulting from continuous point source discharges. The system emphasizes the role of boundary interaction to predict steady-state mixing behavior and plume geometry. The CORMIX methodology contains systems to model single-port, multiport diffuser discharges and surface discharge sources. Effluents considered may be conservative, non-conservative, heated, brine discharges or contain suspended sediments. Advanced information systems provide documented water quality modeling, NPDES regulatory decision support, visualization of regulatory mixing zones, and tools for outfall specification and design. MixZon Inc is the primary contact for CORMIX information, licensing, sales and technical support. 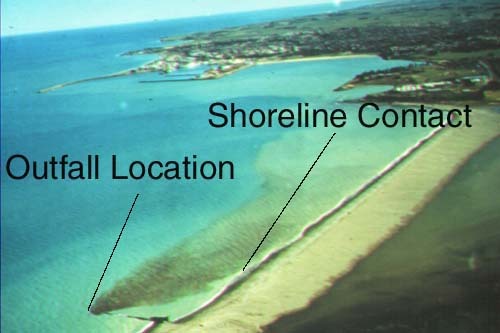 Example of a wastewater outfall where boundary interaction is important within the mixing zone. The plume contacts the shoreline and exhibits upstream density current buoyant spreading. Due to the shallow coastal water, near-field flow instabilities with benthic impacts are likely (Photo: I. Wood). An atmospheric example of turbulent buoyant jet mixing in a stratified shear flow. Initial mixing is controlled by the interplay of discharge and ambient conditions. The CORMIX subsystem CorJet can be applied to initial atmospheric plume mixing as well. (Photo: Ralph Turcotte, Beverly (Massachusetts) Times).